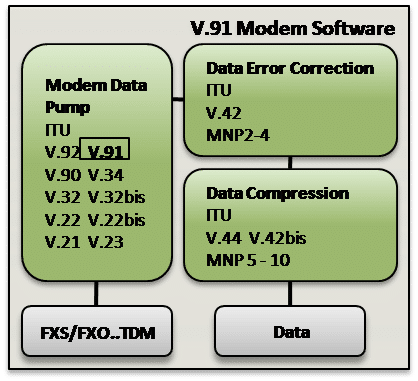 V.91 modem software is fully compliant with the ITU V.91 Recommendation and optimized for most architectures. ITU-T V.91 specifies the operation of a duplex digital modem for use on a 4-wire circuit switched connection and on leased point-to-point 4-wire digital circuits at data signalling rates of up to 64 kbit/s. Contact us to discuss your V.91 modem application requirements. VOCAL’s V.91 modem software is optimized for performance on leading DSP architectures and processors from TI, Intel, ADI, AMD and other vendors. Our modem software may be licensed standalone, as a library or complete design. Custom designs are also available to meet specific modem application requirements. Automoding to devices supporting V.8, and optionally V.8 bis, procedures. The V.91 digital modem is specified in terms of coding, start-up sequences, operating procedures and DTE-DCE interface functionalities. ITU V.91 includes an optional control channel and support for transparent mode on unrestricted 64 kbit/s channels. The network interface and the signalling rate that is used to connect the V.91 modem locally to a 4-wire connection are considered to be country specific matters and are hence not specified. VOCAL’s optimized software is available for the following platforms. Please contact us for specific V.91 supported platforms.